Defense contractors absolutely crushed it in President Donald Trump's first year. The president's aggression and pledge to go on the offensive with the militarily sent defense stocks soaring as soon as November 9, 2016 — the day after he was elected. And in 2017, the SPDR S&P Aerospace & Defense ETF (NYSE: XAR) surged by 34%, compared to 21% for the broader S&P 500. No doubt, tensions are on the rise worldwide. Global defense spending is forecast to rise by 3.3% in 2018 to $1.67 trillion. That's the highest level since the end of the Cold War. And the U.S., as always, will lead the charge. In February, Trump and Congress authorized a $711 billion defense budget for fiscal 2018. That's a 20% increase from former President Barack Obama's full-year 2017 budget request of $580 billion. The Trump administration has also directed its overseas diplomats to act as salesmen for the U.S. defense industry and is cutting back restrictions on U.S. arms exports. Given all that, there's no doubt that defense contractors will continue outpacing the market. The company already plans to sell four SM-3 Block IIA missiles, missile canisters, and other technical, engineering, and logistics support services to Japan for $133 million. These are antiballistic missiles that are intended to defend against the growing threat from North Korea. Furthermore, Raytheon's RTN Missile Systems business recently clinched a foreign military sales (FMS) contract worth $634.2 million for its Advanced Medium-Range Air-to-Air Missile (AMRAAM). And on January 4th, an undisclosed nation that already possesses the Patriot Integrated Air and Missile Defense System — there are 14 such nations — signed a $1.5 billion contract for Raytheon to provide additional capability. No doubt, the Patriot is a huge part of Raytheon's business. It includes radars, C2 technology, and multiple types of interceptors that all work together to detect and neutralize tactical ballistic missiles, cruise missiles, drones, advanced aircraft, and other threats. The Patriot missile defense system is a staple in armed forces around the world. It's currently deployed in 15 countries: America, the Netherlands, Germany, Japan, Israel, Saudi Arabia, Kuwait, Taiwan, Greece, Spain, South Korea, the United Arab Emirates (UAE), Qatar, Romania, and Poland. Sweden could soon join that list because it's initiated the buying process with a letter to Congress. The potential deal will be in the area of $1 billion to $3 billion. Of the 15 nations that have the Patriot, five have actually used it in a total of more than 200 combat engagements. Since January 2015, Patriot has intercepted more than 100 ballistic missiles in combat operations around the world. And more than 90 of those intercepts involved the low-cost Raytheon-made Guidance Enhanced Missile family of surface-to-air missiles. Lockheed Martin Corporation (NYSE: LMT) is the world's largest defense contractor, and its stock jumped by 26% last year. Like Raytheon's Patriot missile system, Lockheed's brand-new F-35 fighter jet is set to see a lot of action and be a major breadwinner. About 300 planes have already been delivered, and that number will double by 2020. Almost 2,500 aircraft will be added to the U.S. arsenal over the next few years, with hundreds more going to U.S. allies around the world, replacing Cold War-era F-16s. 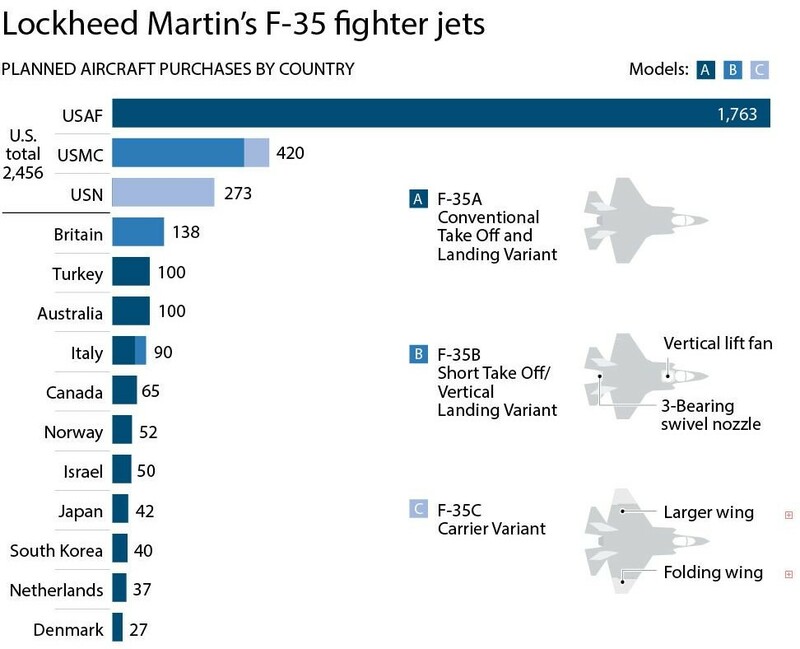 From its inception, the F-35 program has eight partner countries that have helped pay for its development and are poised to purchase over 600 of the planes. Another 800 planes are expected to be bought by other countries through the Foreign Military Sales program. In December 2016, Israel was the first country outside the U.S. to acquire the F-35. It's since received the first two planes out of an order of 50. And in May, it became the first nation to deploy the stealth fighter in combat. "We are flying the F-35 all over the Middle East and have already attacked twice on two different fronts," said Major-General Amikam Norkin. Lockheed has also found an eager new buyer in Japan. The country recently approved the purchase of two Lockheed Aegis Ashore batteries at a cost of $2 billion. It also recently received a $10 million contract to outfit the USS Stout with its AEGIS Ballistic Missile Defense (BMD). Furthermore, Japan and South Korea are also considering buying the short takeoff vertical-landing variant of Lockheed's F-35. Both countries are already buying scores of the conventional takeoff version: the F-35A. But having the F-35B in their arsenals would enable them to deploy the stealth fighters from ships, not just from land bases. Lockheed isn't just gaining in the defense industry, either. It's making a serious effort to push into the broader tech sector. It has a lab in California that's working on things like advanced telescopes, which could be used on satellites, drones, and driverless cars, and also a next-generation battery to replace lithium. Such technologies have a military application, for sure. But they could also be applied to the civilian sector. The company also launched a venture capital (VC) firm, LM Ventures, for scouting and financing small Silicon Valley upstarts. Aerospace — jets and other aircraft. Combat systems — tanks, combat vehicles, and light armored vehicles. Information systems and technology (IS&T) — secure communications, command, and control systems, imagery sensors, and cyber tools. Marine systems — complex ships like nuclear submarines. There's no shortage of lethal machinery at General Dynamics. But the company's true goal is to become the government's leading IT provider. After a brief bidding war, GD plunked down $9.7 billion, or $41.25 per share, to acquire CSRA and establish itself as a behemoth in the sector. As I mentioned, the defense budget is set to balloon and a lot of money will be spent to modernize federal IT systems. For example, the Department of Defense (DOD) has begun shopping a 10-year $10 billion cloud initiative, known as JEDI (Joint Enterprise Defense Infrastructure). It seeks to streamline and centralize the labyrinth of often incompatible and inaccessible databases into one cloud-based data cache that can be accessed on the front lines of battle, where information is at a premium. Furthermore, the DOD wants to bring a second group of applications up to date with another proposed cloud acquisition worth up to $8 billion. These are some big fish that could secure not just the one-time contract to build the cloud, but also years of recurring support and development revenue. It's a major opportunity. And it's bringing in big tech names, such as Amazon and Oracle, and rival defense contractors. But by establishing itself as the go-to IT maven for the Pentagon, GD has a firm foothold to contend for those massive projects. In fact, CSRA is already involved in a separate effort to move DOD systems to the cloud through a $500 million contract known as milCloud 2.0. And GD nailed a recent $300 million project to operate and maintain IT networks for the Army. An analysis by the government contracting market research firm Govini, found that the combined company has locked in $22.7 billion in total unclassified contracts from fiscal years 2014 to 2017. That's 22.1% more than its closest competitor, Leidos, and makes GD far-and-away the largest recipient of federal IT services dollars. Northrop Grumman Corporation (NYSE: NOC) is another defense behemoth. Autonomous systems — drones, satellites, and space systems. Strike — such as the B-2 Spirit stealth bomber. C4ISR (command, control, communications, computers, intelligence, surveillance, and reconnaissance). Last September, Northrop acquired Orbital ATK — a maker of defense satellites, launch vehicles and tactical missiles, and also precision weapons — for $9.2 billion. Orbital brought more than $4.6 billion in revenue for 2017, a $15.4 billion contract backlog, and free cash flow of $250 million to $300 million. This acquisition will help the company in its push to manufacture the next generation of ICBMs for U.S. strategic deterrence. The U.S. Air Force will start evaluating design concepts for the new intercontinental ballistic missile defense shield next year and reach a conclusion in 2020. Northrop Grumman and Boeing are developing competing designs. But Orbital ATK is one of just two manufacturers that can make solid rocket motors for the program. And now, Northrop owns it. On top of that, Northrop Grumman has seen a steady stream of revenue from aviation products like the MQ-4C Triton and the E-2D Advanced Hawkeye. The Triton is a drone that provides real-time intelligence, surveillance, and reconnaissance (ISR) over vast ocean and coastal regions. In November 2017, the U.S. Navy announced plans to deploy Tritons to Florida, Italy, and the Middle East. The Navy has ordered 68 Triton aircraft in total. The Hawkeye, meanwhile, is often called the "digital quarterback" of the battlefield. It monitors the surrounding area and communicates to battle groups to keep them from harm's way. 5. Huntington Ingalls Industries, Inc.
Huntington Ingalls Industries (NYSE: HII) is America's largest military shipbuilding company, operating in Newport News, Virginia, for 131 years now. It's the sole builder of U.S. Navy aircraft carriers — the world's largest warships — and one of two builders of nuclear-powered submarines. It also builds Aegis guided-missile destroyers, amphibious assault ships, and the Coast Guard's National Security Cutter (NSC). In all, HII has built more than 70% of the Navy's warship fleet. It has annual revenue of approximately $7.1 billion and a current backlog of $23 billion. Strangely though, one of the company's largest contracts has nothing to do with defense at all. Rather than churning out another ship, the group was awarded a $1.39 billion cleanup contract at the Los Alamos National Laboratory. The contract runs for 10 years and three months. HII stock climbed by 24% last year and gained entry into the S&P 500.